Yesterday as I mentioned before here in Cyrsti's Condo, was my monthly visit to my therapist. The session went as expected with extra emphasis on Veteran's Administration mandated surveys they are over prone on occasion to give out. The surveys basically delved into potential depression and it's results. 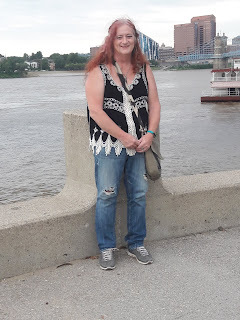 We also went into the Trans Ohio Symposium information I recently received and I am scheduled to present one of the first workshops on Saturday morning. I laughed I would potentially still be hung over from the attendee mixer the night before which we always attend at Columbus, Ohio's Club Diversity. Liz and I always safely Uber about the city on our pre-destined trips to alcoholic venues. "Maybe I can save you a trip to the therapist (or give you something to talk to the therapist about). Have you considered that the littered vacant lot could represent your past - experiences you lived, but now wish would just go away? I think, when we transition, we may be anxious to be rid of the male persona in favor of a new totally-feminine existence. All of our past experiences culminate into who we are, though. In the (long) process of transitioning, I believe that it's impossible to vacate our pasts, but we do begin to view them from a different perspective. Although there may be much that litters our past, the important things, like close personal relationships, can't be ignored. Today is my first daughter's 40th birthday (how can that be, when I am still in my 40's?). :-) I have been reminiscing about her this morning, and, although I wouldn't ever want to forget anything about her, there are some not-so-great things that litter my memories - the time when she was about eleven, and accidentally caught me cross dressed, being one of the most regrettable. We can't erase anything, but we can pick up the pieces and try to put them into a new perspective. There are plenty of other things from my past - good and bad - that I will never forget, but I certainly don't talk about them as I might have years ago. Sitting around with a bunch of guys (even if they are in dresses), trading stories in a one-up-man-ship manner, is just not appealing to me these days. It only ever was because I was so into the overcompensation game of hiding my femininity with demonstrations of hyper-masculinity. Oh, how silly I now see myself to have been!